Have ready four (6-ounce) cups or ramekins. In a medium saucepan, whisk together the sugar, cocoa powder, espresso powder, salt and water until it is a smooth paste. Whisking constantly, bring the mixture to a boil over medium heat. Remove from the heat and add the chocolate (if using), stirring briskly until melted. Stir in 1 3/4 cups of the half-and-half. In a small bowl, whisk together the cornstarch and the remaining 1/4 cup of half-and-half. Stir the cornstarch mixture into the chocolate mixture. Cook, whisking constantly, over medium heat until the mixture begins to thicken. Reduce the heat to low and continue to cook for another minute. Remove from the heat and stir in the vanilla. Pour the pudding into the cups/ramekins. (If you do not want a skin to form, immediately press plastic wrap directly onto the surface of the pudding. Refrigerate for at least 2 hours or up to 2 days. 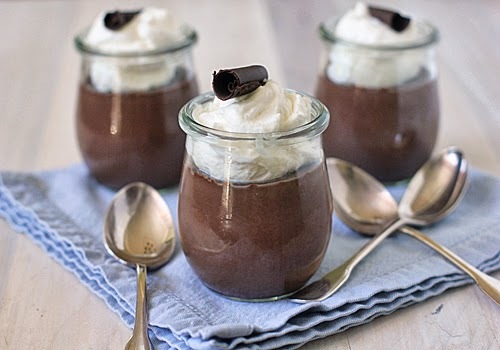 Serve with whipped cream and grated chocolate or curls. Enjoy! I love your Sunday dinners. We always had a fancier meal on Sunday and often went to a relative's house. This brings back memories. Thank you. I enjoy sharing them. Do you think this could be used as a pie filling, or is there enough. I can't say for certain, but I would make at least 1 1/2 of the recipe to fill a pie shell. Pudding is such an easy thing to make. My go-to is the Hershey's cocoa recipe - very similar to yours. And like you, I add espresso powder. And I agree with Peggie - I love your Sunday recipes/menus. I always try to make Sunday a special occasion and have used your recipes for inspiration.